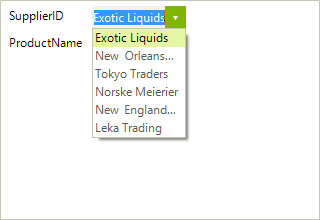 This article will walk you through the process of changing the default editor to a bound drop down list, where the current value corresponds to a value within the drop down list data source. The case where the corresponding values are nullable is also handled. 1. First you can subscribe to the BindingCreating, BindingCreated and EditorInitializing events of RadDataEntry (please note that this should be done before the data entry control is being data bound). 2. In the EditorInitializing event handler, you will be able to change the automatically generated editor with RadDropDownList. In addition, you should set it up as needed. In this case we will set the DataSource, DisplayMember and ValueMenber properties. 3. In order the values to be synchronized correctly, the bound property should be set in the BindingCreating event handler. In this case it should be set to the SelectedValue property. 4. When the data source is using nullable values in order the user to be able to change the current value via the drop down list, the result value should be manually parsed. This can be done in the binding's Parse event. You can subscribe to this event in the BindingCreated event handler (in order this event to fire the formatting should be enabled). To make the example complete you can use the following classes. You can initialize the data sources in the Form’s constructor.